The International Association of Registered Financial Consultants (IARFC) Board of Directors proudly recognize the outstanding financial service rendered by Money Concepts to the public and to their own family of consultants. An Official Proclamation was presented to President and CEO Denis Walsh, RFC® by IARFC Chairman H. Stephen Bailey, MRFC during Money Concepts’ Financial Planning Congress awards banquet recently held in Charleston, SC. Founded in 1979, Money Concepts has consistently delivered professional services fulfilling the standards of education, examination, experience, ethics, conduct, licensing and continuing professional education that is a requirement for designations from the IARFC. They hold in high esteem the ethical responsibility to advisors and the clients they serve. 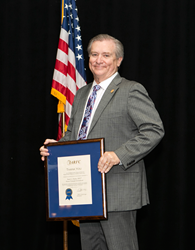 In addition, Money Concepts Executive Vice President Barry Dayley, RFC® was given recognition for his service on the MRFC Certification Board that is working towards accreditation of the Master Registered Financial Consultant credential. The application has been submitted to the NCCA (National Commission for Certifying Agencies) and the IARFC home office is waiting for the decision which should be forthcoming in August. As part of the Financial Planning Congress, members of the IARFC Team Wendy Kennedy, Susan Cappa and Chairman Bailey were out in force greeting MRFCs and RFCs and giving out information to prospective financial consultants who have met the requirements to obtain the designation. To learn more about the IARFC Association, the MRFC, RFC and RFA designations and the 2018 IARFC Biltmore Conference, in April – visit http://www.iarfc.org.